A. New Plant Breeding Techniques (NPBTs) will be developed and implemented to promote chicory into a new, robust, multipurpose crop to produce dietary inulin and bioactive terpenes for a bio-based economy. 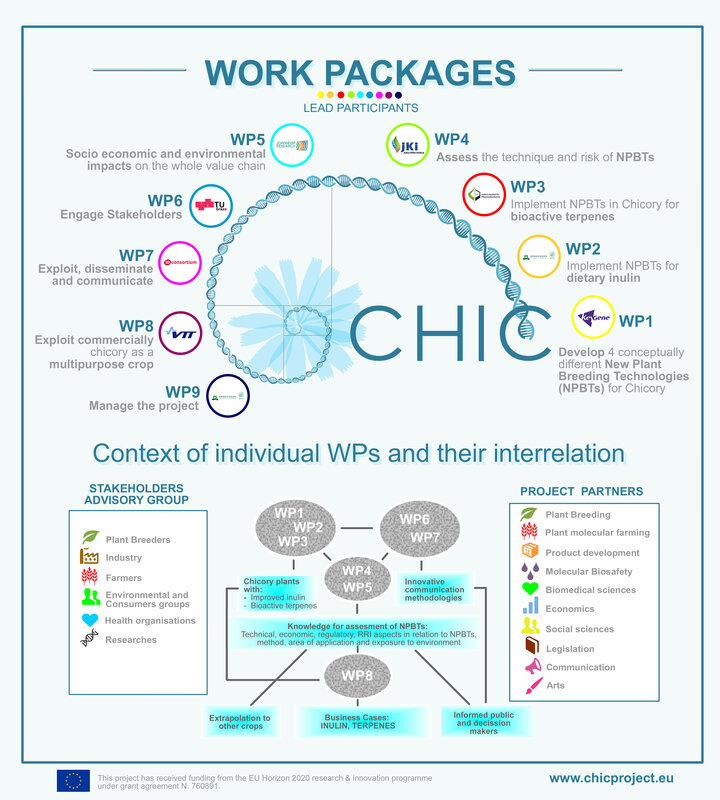 B. Interactions with relevant societal and industrial stakeholders will be organised to implement a transparent and acceptable chicory innovation process. Multiple and dedicated communication pathways, including Arts and Sciences, will be employed for communication with stakeholders, policymakers as well as the public at large. C. New data related to the implementation of NPBTs on the chicory value chain will be assessed with respect to efficacy, potential risks, legislation and socio-economic and environmental impact. D. Two business cases (inulin and terpenes) will be developed to initiate commercialisation of the CHIC results.